When it comes to getting everything squared away in your business before year end, things can get stressful. This checklist can help you collect all the items that you need before the year ends. That way when it comes to filing your individual and business tax returns, things will all go smoothly. When paying contractors, one of the items that we like to emphasize to our clients is getting those W-9 forms. It’s always beneficial to collect the W-9 forms before writing a check to pay a bill or vendor. That way you have proper documentation when you file your yearly 1099’s with the IRS. In fact, you should be requesting updated forms on a yearly basis from all your independent contractors. Annual employee bonuses are a great way to spend any extra cash that you have in the business account. It also shows your employees that you see all the hard work that they are putting in and reassures and says to them, hey, I see what you’re doing, and I really appreciate it. What a great way to boost morale in the office, right? And after all, you want to be sure that you are minimizing your tax liability at the same time by taking the bonuses as tax deductions. Typically, you should be looking at these on a monthly basis but doing it all at once is always an option too. Better late than never. And don’t forget about those cash receipts either – your bookkeeper/accountant will need your cash receipts to make sure that those are properly allocated in your books, so you can take the deduction. A little time saver for them: write down where you think this expense should be assigned; sometimes the receipts don’t tell them exactly what you bought. It is also a great idea to go through those shareholder distribution/draws too. What if you took some money out for a company lunch? What if one of those is for repairs and maintenance? These could be business deductions for you. Unfortunately, the only negative part is that if the expense was somewhere in the beginning of the year, you may not remember what you bought. It would be ideal to implement a monthly review of the shareholder distribution reports. Not only should you do all the above to get the year nicely wrapped up, but the best way to really get a step ahead of the game is contacting your tax professional or bookkeeper for a year end consultation. No one knows your books better than they do and they can give you advice when it comes to spending or saving. Getting ahead of the game is always a plus. Need help on other items that may have you stumped? 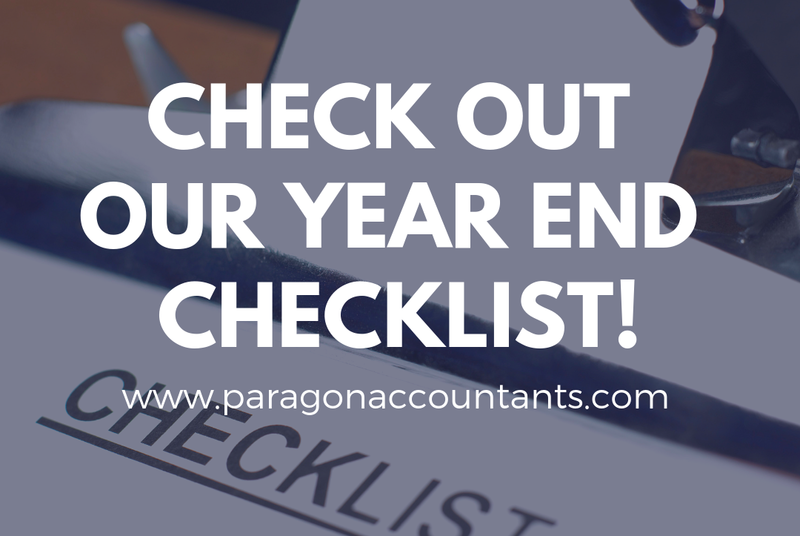 Call Paragon Accountants today and see what we can do for you when it comes to preparing for year end. Since when was it ever a bad thing to be over prepared? We’re always here to help.